I love this skirt from the Phillip Lim for Target collection. Not necessarily for the print (although it is rather unique), but for the design. I can't say no to a soft A-line skirt. It offers a feminine silhouette that's both flattering and versatile. On top of the modest length, I also love how it sits high on the waist. Conservatively styled with a blazer and tall flat boots for a mild fall day, but it can easily be styled up or down. Did you pick up anything from the Phillip Lim for Target launch back in September? I wanted the Boom sweater, too, but not badly enough to wait hours in line for it. Stores were kind of crazy in metropolis. I have this skirt and I love it. 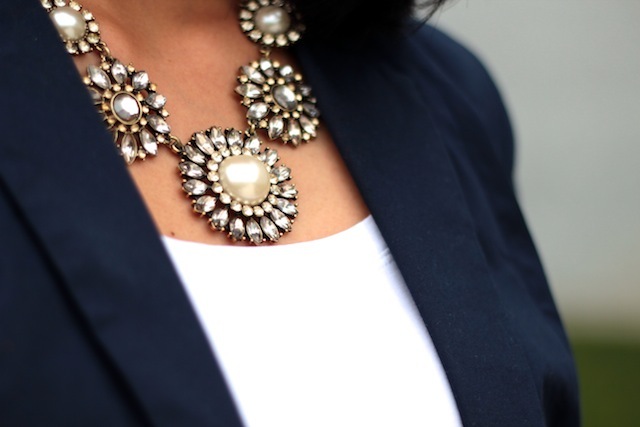 It looks great the way you have styled it with the statement necklace! Love that necklace! What an adorable look - that skirt is absolutely stunning on you! i had totaly forgot about the lim release so didn't stand outside waiting in line for the doors of target to open. sort of wish i did if only for the bag.